Heirloom Food Stories aim to connect you to beauty, wisdom, and intuition in your kitchen. Each month we’ll deeply explore one fruit or vegetable, so we can know the whole stories—the joys, hardships, and curiosities—behind the foods on our plates. I’m no master gardener, but for each of the past four years, our raised beds have contained zucchini. It seems like the ultimate foolproof vegetable—one that can always be counted on to produce and produce and produce. Zucchini belongs to the cucurbit family (don’t you love that name?!) along with melon, cucumber, and hard-skinned squash like pumpkins. It’s a summer squash, which means it’s harvested before autumn sets in and the rind becomes hard like those of butternut or acorn squash. Orangey yellow zucchini blossoms are also edible and incredibly yummy. In my family, they get stuffed with cheese, dredged in egg, fried ‘til golden, and often sandwiched between two slices of bread. I get giddy every time I see them at the market or in my garden. If you’re harvesting them yourself, look for flowers attached to narrow stems (the non-fruiting males) versus flowers attached to stems that look like baby zucchini (the fruiting females). According to the University of Arizona’s Master Gardener Journal, summer squash can be traced all the way back to 5,500 B.C. where they were a staple of Mexican and northern South American diets. After Europe colonized the Americas, summer squash was brought across the Atlantic, where it is believed that the Italians developed zucchini, giving it the name we now use. Interestingly, even the name implies that the plant is going to be a big producer. It comes from “zucchino,” the diminutive form of “zucca” which means “gourd” or “squash.” “Zucchini” is the plural form, because—obviously—there’s never just one “zucchino”! Each sprawling plant can produce about 3-9 pounds of young fruit(!). Those numbers made Barbara Kingsolver wonder in Animal, Vegetable, Miracle: “Could they design an automobile engine that runs on zucchini?” Imagine the problems it would solve if they could. After my technical research, I put my nose in a different kind of book. Who knew children’s books could be so packed with wisdom? I’ve been in Zora’s shoes many times before. In summers past, I simply couldn’t unload my excess veggies on friends and family fast enough. With all this history of zucchini’s prolific success, when I sowed my plants this year, I was certain I’d be swimming in the stuff come August. But, for whatever reason, it did not show up to the party. Perhaps it has something to do with our 57-day rainless streak (and our related struggle to keep up with watering). So now, instead of being the “sharer,” I find myself in the position of the “sharee”—dependent on the generosity of folks who’ve had a good harvest. Lucky for me, I’ve spent the past two weeks with family in Ohio, and they’ve shared their garden goodies with me so freely. My dad planted a garden at my grandma’s that grew so rampantly that the rows are no longer distinguishable. I spent a lot of time in there harvesting beans, tomatoes, eggplant, and broccoli. Navigating the stalks and leaves felt like a jungle adventure. Their proverbial cup was overflowing, and they shared it. I know I would do the same for them. There are moments when you’ll have a surplus of something—time, resources, friends, food, privilege—when someone else is having a moment of scarcity. Conversely, there are moments when things are thin for you; allow someone the opportunity to help. These acts knit together a resilient communal safety net, one that becomes stronger every time we reach across to give or receive. Our success as a culture of people from all kinds of backgrounds and ever-changing circumstances lies in this exchange. Fried Zucchini Flowers—stuffed with a combo of mozzarella and ricotta (or whatever you have, really), dredge in flour and egg, drop in about 1/2 inch of hot oil, and serve either by itself, with a salad of fresh herbs and tomato, or as a sandwich. Zucchini Pizza—add it to your standard dough. This is my go-to. Shaved Zucchini Salad—grate zucchini on the large holes of a cheese grater and dress simply with lemon zest, lemon juice, olive oil, salt, and shavings of a hard cheese like grana or parmesan. 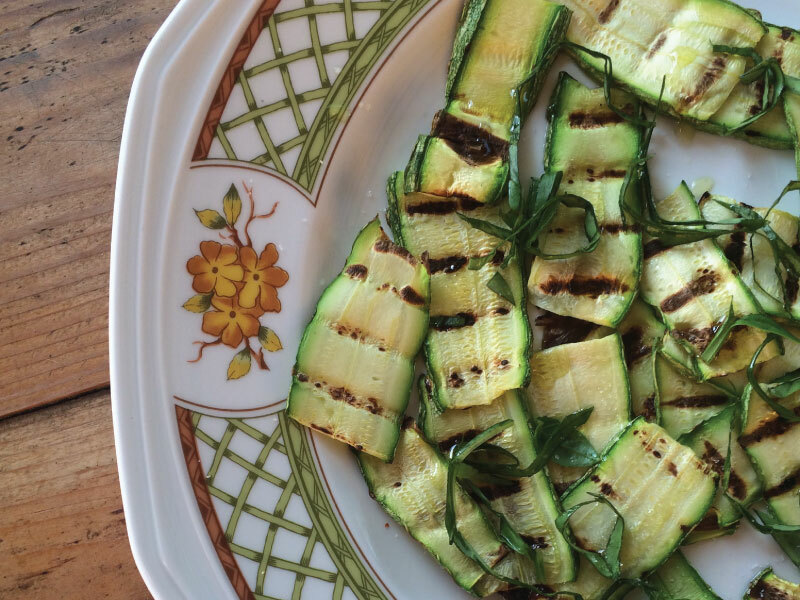 Herby Grilled Zucchini Salad from my friend Chicca in Italy. Ratatouille a la Julia Child from Mastering the Art of French Cooking. This has many steps and is quite delicious if you’re in the mood for a little kitchen project. Leave a “free box” full of surplus produce, clothes, books, or other supplies in your front yard. Check your local farmers market to see if they have a “swap station” for food or other items. If they don’t, maybe you could be the one to start it! Share your wealth with a cause you care about. Right now, I’m sending my support to Wayfinding Academy, Southern Poverty Law Center, and the American Civil Liberties Union. Next time you have more than enough, channel your inner Zora and spread that good around. The world needs what you can offer. Heirloom Food Stories aim to connect you to beauty, wisdom, and intuition in your kitchen. Each month we’ll deeply explore one fruit or vegetable, so we can know the whole stories — the joys, hardships, and curiosities — behind the foods on our plates. If you liked these stories, you might really enjoy my new offering in partnership with The Recipe Hunters, Heirloom Mail. It’s a monthly “food learning adventure in a box” that highlights one handpicked (surprise!) ingredient with art, stories, and cultural wisdom behind it. You’ll learn and grow as a home cook, one ingredient at a time. Check out more details and subscribe here by September 20th to receive your first box in October. LOOKING FOR CREATIVE FOOD INSPIRATION? EACH MONTH I CREATE A NEW PIECE OF ART, FEATURING A NUGGET OF WISDOM YOU CAN INTEGRATE IN YOUR OWN LIFE. Thank you for joining me on this adventure!